The spontaneous crystallization resulting from rapid agitation of a super saturated purified sugar solution produces an aggregate of micro sized crystals. By application of the basic principle of the spontaneous crystallization process is known as as Cocrystallization and it was developed by Chen in 1982. 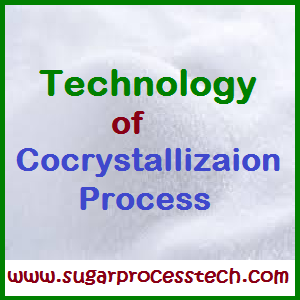 It is defined as a process where by a second ingredient is incorporated on a micronized sucrose crystals by unique phenomenon of spontaneous crystallization. The highly purified sucrose acts as a base to which a second ingredient is added to form a new structure, providing agglomerates with new functionalities. Physical Structure: The structure of the cocrystallized product is distinctively different from the crystallinity of granulated sugar. Individual grains of cocrystallized sucrose are agglomerates of microsized crystals (3-30µm), with the additive ingredient primarily located in the interstice between the crystals. Between these agglomerates is a multiplicity of interstices. Because of the porous agglomerates of microsized crystals that are inherently characteristic of spontaneous crystallization, all cocrystallized products offer desirable tabletting characteristics and fondant quality. It inhibits premature crystallization, there by allowing crystallization to occur at a controlled, reproducible. It greatly enhances the functionality of the final product. Functional Characteristics: Using the cocrystallization process, many categories of selected ingredient, singly or in various combinations, can be permanently incorporated into a sucrose crystalline aggregate. thus, providing interesting and useful characteristics. Molasses, honey, and maple syrup are considered as healthful sweeteners among the general population. These products are made by combining honey, molasses, or maple syrup with an in-process stream of syrup from the cane sugar refinery by the cocrystallization process. The products generally having the following characteristics. Dry, granulated, free-flowing, and in a noncaking form. Instantly soluble in a liquid system. Composed of 100% natural ingredients. Molasses granules, a free-flowing dry molasses product, is manufactured by the cocrystallization process whereby edible molasses is incorporated into the sucrose matrix. The product is a noncaking aggregate with a rich molasses flavor and color and the sweetness of refinery syrup. The typical composition is 91% sucrose, 2.5% invert 3.0% ash, and 0.75% moisture. The bulk density is about or 640kg/m3. Honey granules are manufactured by a cocrystallization process whereby a natural, liquid honey was incorporated with selected in-process refinery stream liquor. The product is free-flowing, noncaking, and in granule form. It provides not only sweetness but also a unique honey flavor and taste. It also has the advantages of being an “instantly” soluble property in solution and can be used as a table-top sweetener and as a food ingredient in ready-mix formulation. The typical composition is 92% sucrose, 7% invert sugar, 1.0% ash, and 1.2% moisture. The bulk density and pH of this product is 40lb/ft3 or 640kg/m3. Dry maple product with significantly reduced cost was developed by the cocrystallization process by Domino Sugar Corporation. In this process, pure maple syrup was incorporated into a selected refinery sugar stream and a natural flavor was used to enhance flavor of this product. The product is noncaking, free flowing with a rich maple flavor and instantly soluble property. The composition of this product is 93% sucrose, 4% invert sugar, 0.5% ash, and 0.5% moisture. Sugar Technology by Albert Bartens KG. Handbook of Sugar Refining by Chung Chi Chou. What is jaggery or Gur, flow chart steps in jaggery making process, and also discussed about Organic Jaggery Vs commercial jaggery. Raw sugar definition, basic steps for raw sugar making process and raw sugar specifications.